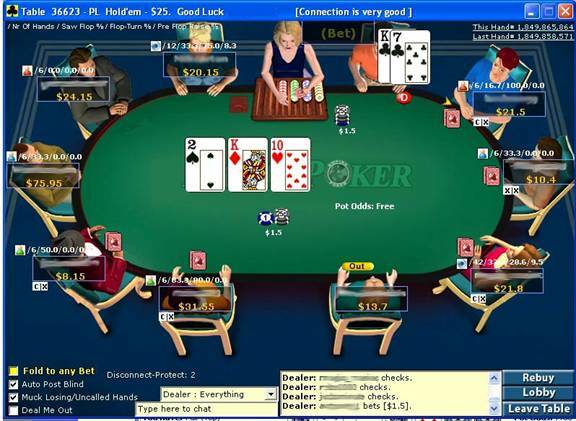 "PokerOffice is the most sophisticated tool on the market for Online Texas Holdem Poker. PokerOffice allows you to track all of your opponents actions as well as your own game, while you are playing, without any need for hand histories or user input. It stores all of the collected data and brings you summarized statistical reports, spreadsheets and graphs of your own and your opponents play. 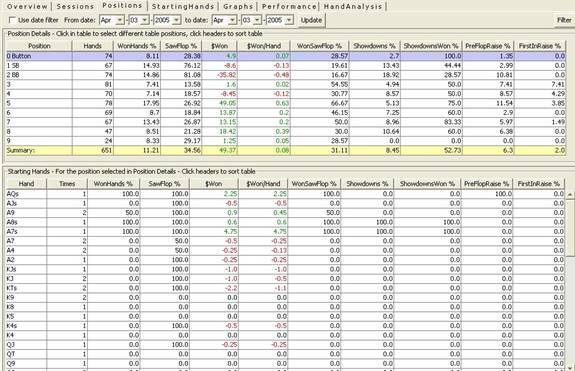 In addition it comes with a Live Advisor Window that displays real time opponent modeling of the players you are currently facing, real time probabilities of future hands, hand rankings, Pot Odds and live graphs and statistics." Currently, PokerOffice supports ring game and tournament functionality from the following sites: Party Poker, B2B Network, Ongame Network, Ladbrokes, Microgaming Network, 888 Poker , PokerStars and iPoker Network. Tip: Copy all your hand histories into one folder then import that whole folder, it will probably save some time. Live Tracker: The Live Tracker option allows you to auto-import hand history data without having to manually import and information. As you play, live tracker automatically updates, giving you live analysis statistics right on your desktop. Simply hit Start Live Tracker from the menu to begin. Knowing how to use live tracker effectively is found below. The overall software is divided into two parts; Ring Games & Tournaments. Each section is then separated by the following categories: Overview, Sessions/Tournaments, Positions, Starting Hands, Graphs, Performance, Hand Analysis. Select the player you wish to run the analysis work on by going to Ring Games or Tournaments ? Select Player, or by simply hitting the Select Player Icon. The Overview section consists of Player Summary, Game Details, and Starting Hands. At the top you can filter out a specific time period, or just run it for all history. This section contains the basic overview of the selected player’s stats. Consisting of Level, Hands, Hands Won %, Saw Flop %, $ Won, $ Won/Hand, Won Saw Flop %, Showdowns %, Showdowns % Won, PreFlop Raise %, and First in Raise %. This section shows the complete results of each game, including all the community cards, the pot amount, the rake, and the winner. 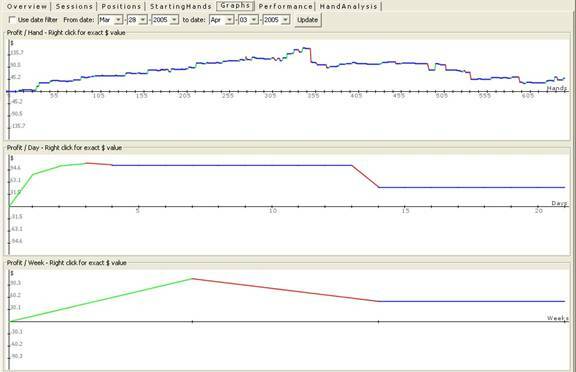 Here you can view the results of each starting hand that player played, including the amount of money that player won/loss from that hand, the frequency that hand is played, as well as if the person often raises that hand preflop or not. The Overview section is just what it is, an overview. You are able to judge for yourself what hands are profitable for you, what hands you need work on, and get a good assessment of how you stand. Though these stats are nice, it is not recommended that you pay too much attention to what they stand for until thousands of hands are played. If you have only played a certain hand a couple of times, it is not a good sample size of how well you are playing that hand. Pretty much the same data display as the Overview section, except this is by session. 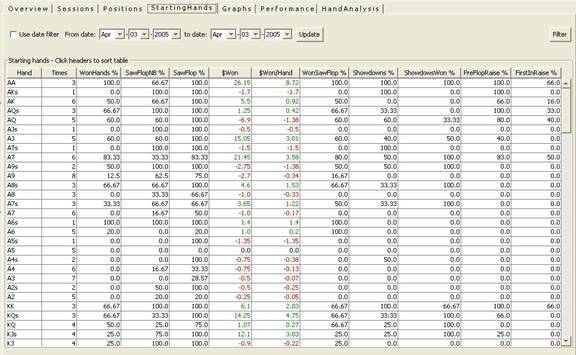 Useful tool in reporting how much profit/loss you made each time out. There is an extra graph in there to display your profitability by hand count. Not much use in my opinion, but it’s there. The Player Relative Performance compares your data with others that played during that section. The Positions tab displays your statistics by hand by playing position. This page can be extremely useful, as you can determine if you should be playing certain hands in certain positions, or whether or not you should be raising with certain hands in different positions. Same idea as the positions page, but simply shows each starting hand in a full screen. More results of your play at each play level can be found here. Extra categories in the Level Performance Summary include: Winning Session %, Average number of players, Hands per Hour, Total Rake. By using the Rake and Average number of Players figures, you can easily calculate your anticipated Frequent Flopper Rakeback. The Player Toplist is another useful list, as you can mark your shark list, and pinpoint your fish list by simply sorting the Won$ column. Another useful sort is by the Saw Flop%. By doing this you can determine the loose players as well as the rocks. By sorting the PreFlop Raise % and the First-In Raise %, you can distinguish between the aggressive and passive players. 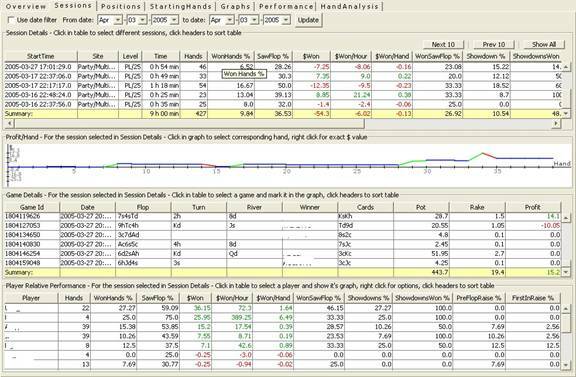 Hand Analysis displays your statistics by Hand Type after the flop, and the results of each hand. 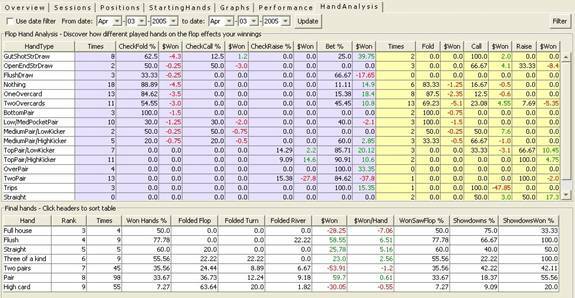 The first half of the “Flop Hand Analysis” (Purple shaded), shows the figures when no bet has been made. While the second part (Yellow shaded), are values when a bet has already been made. The Hand Type shows everything that you have faced so far, including specific drawing hands like a gut shot straight draw, or a made hand like Trips. You get to see how many times you have played that hand, your winnings from it, your check/action percentages, and so forth. 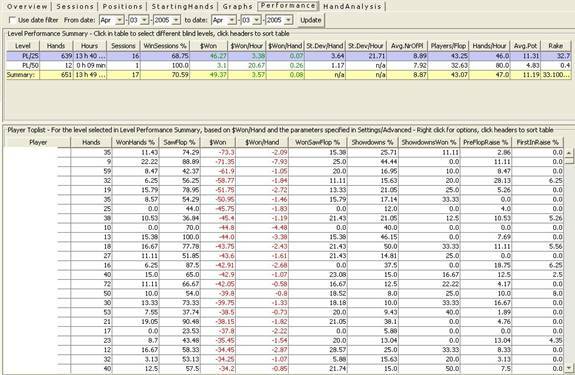 The bottom section is composed of the “Final Hands” and the respective statistics. Probably the most import aspect of PokerOffice is its Live Tracker function. Live Tracker provides the user with valuable instant information while playing or observing (data mining). From playing style to calculating odds and probabilities, everything is laid out nicely for you. Start Live Tracker by hitting the “cogs/gears” icon, or by going to Live Tracker -> Start Live Tracker. When the popup appears, select the desired poker room, and leave everything else as default. You can change the view to your liking, but it is not recommended that you uncheck any of those stat checkboxes. 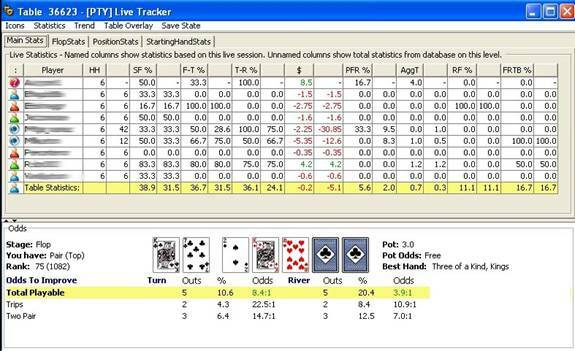 Before playing with Live Tracker for the first time, it is recommended that the Player/Table Icons legend is memorized, printed out, or kept open. To open up the legend, go to Live tracker -> Player (or Table) Icons. This customizable legend will let you categorize each player by their playing type. 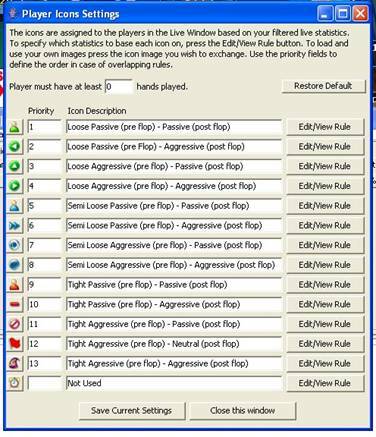 Anywhere from Loose Passive (preflop) – Passive (post flop) to Tight Aggressive (preflop) – Aggressive (post flop). By clicking on Edit/View Rule, you can change the definitions of each player type. There are many different factors to choose from here, but a few of the more important ones are: Saw Flop %, Pre Flop Raise %, Aggression Factor (Raise % + Bet % / Call %), and Voluntary $ Put in Pot %. For higher stakes, a steal % might be a good idea as well, but for low stakes, it’s not a big of an issue. This information is vital, and will be explained later below. When Live Tracker is running, PokerOffice makes a few tweaks and upgrades, and what it does to your poker table is astounding. And the best thing about it, most of it is customizable! Pot Odds: Displayed in white font in the middle of the table, are now your instant pot odds. As each bet/raise is made, the pot odds automatically calculate for you. In the example, pot odds are free as the user is the one who made the bet, but if the next person were running PokerOffice, they would see “Pot Odds: 2:1” Now you can quickly judge, whether your open ended straight is worth a call! Another option you can add on here is the display of “Rank and Outs” Though Rank isn’t really required unless you are a novice poker player, “outs” will provide a quick sum of all your potential outs. Player Icon: On the top left corner of each player’s information box, a small icon will appear. This icon relates to the Player Icons mentioned earlier. With this information you can instantly know what type of player he/she is, and more importantly how to play against him/her. Player Statistics: Beside the player icon are the following statistics based on each player: Number of Hands played / Saw Flop % / Flop-Turn % / Pre Flop Raise %. These are the current default displays, but by going to Live Tracker -> Customize Poker Table Overlay, you can decide what displays to show. *Tip: Number of Hands and V$PP should definitely be part of the display. Play around with it until you find something you like and can take advantage of. A legend of the options you turned on is displayed in the top right hand corner of the window. 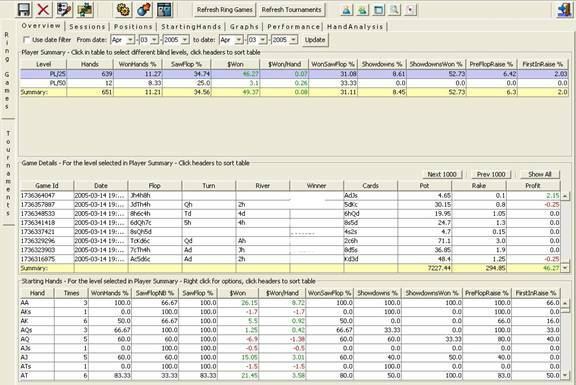 The Live Analysis Window acts as an advisory tool, pretty much PokerOffice pocket style, and a live environment. All the stat options discussed previously can be placed in this window. You can scroll through the main stats, stats after the flop, stats depending on position, and starting hand stats. This displays all the players playing at the table including yourself (You can toggle yourself on and off if desired). Below the analysis window is a visual display of your hand, and the community cards. Also display are your odds in improving your hand, what the actual potential hands are, your outs, pot odds, and the best hand possible. With the analysis table combined with the odds display, decisions will come easily, and learning your opponents has never been easier. PokerOffice is a must have for Party Poker (Including skins) & PokerStars players. This software is incredible, and helps you gain valuable opponent information you would otherwise be without. It also helps you bridge the gap between the research you have done through books, and applying them to the actual game. A couple issues to look out for: Make sure you gather enough data before you make certain decisions. A 5 hand sample of a specific scenario is not enough to warrant a judgment. Also try not to rely completely on the software. If you play live, you will not have PokerOffice in front of you. If you play on another site not supported, you will not have it front of you. Knowledge entwined into your brain becomes a much more valuable asset. Future Support and lacking features? Other poker sites, player notes, bulk hand history upload.